This fall and winter, the Smithsonian will present two exhibitions about Thomas Jefferson. 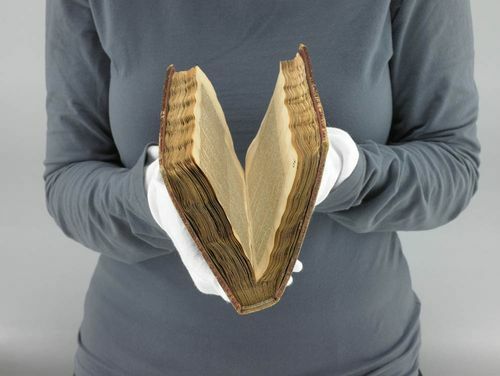 “Jefferson’s Bible: The Life and Morals of Jesus of Nazareth,” is open through May 28, 2012. “Slavery at Jefferson’s Monticello: Paradox of Liberty,” will be open Jan. 28 through Oct. 14, 2012, at the National Museum of African American History and Culture’s gallery in the National Museum of American History. 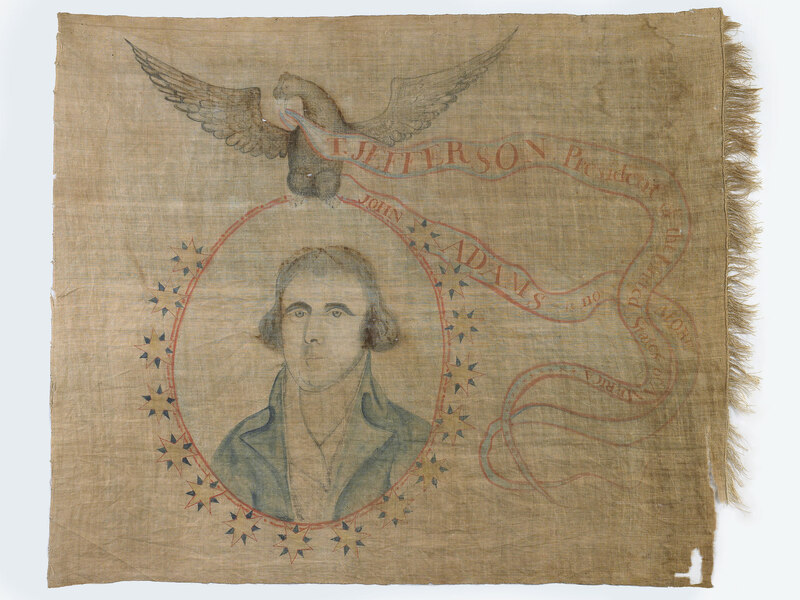 In addition, the Smithsonian has a collection of Jefferson’s artifacts and documents. 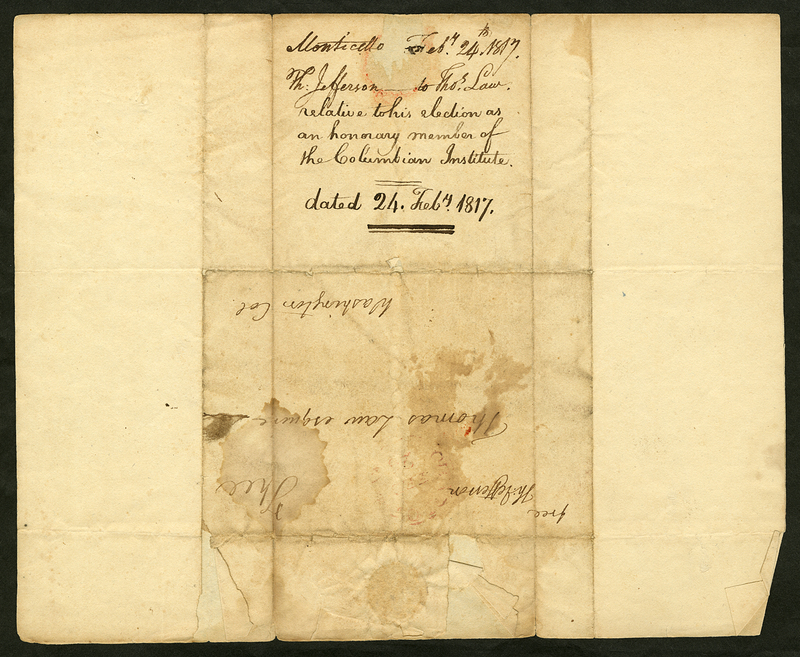 For more information visit www.gosmithsonian.com/jefferson. Jefferson used his portable desk to write drafts of the Declaration of Independence then sent it to his granddaughter, Eleanora Randolph Coolidge, as a wedding gift in 1825. In 1880 the Coolidge family donated the desk to the U.S. government. Using excerpts from the Four Gospels of the New Testament, Jefferson arranged the text to tell a chronological and edited story of Jesus’ life and moral philosophy. Jefferson organized an expedition lead by Meriwether Lewis and William Clark to explore the Missouri River and routes to the Pacific Ocean. The compass was carried by Clark throughout the journey. An avid writer, Jefferson used the polygraph to create simultaneous copies of his manuscripts and often wrote to Charles Willson Peale, the owner of the American rights to the polygraph, to offer his suggestions on improving the mechanism. Trumbull painted this portrait of Jefferson using his preliminary study for “Declaration of Independence” as a guide. 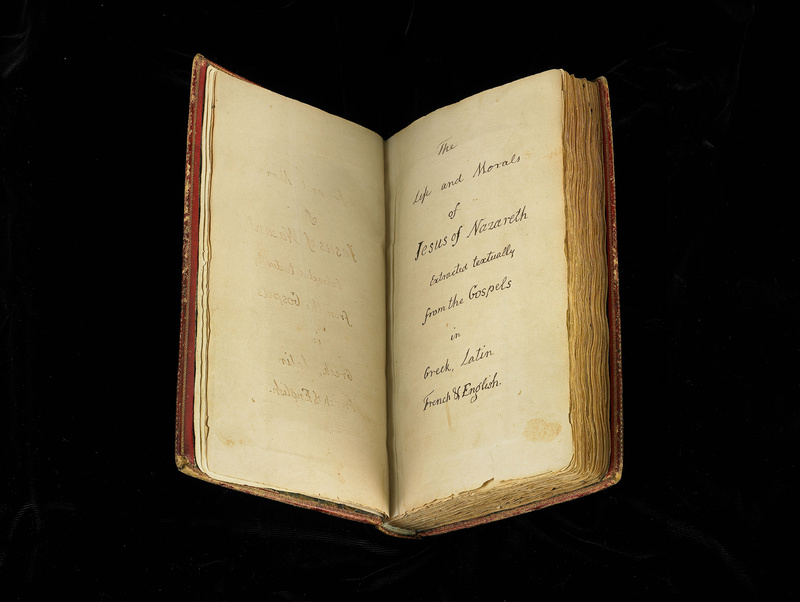 He then gave it to Maria Cosway, a British miniaturist and friend of Jefferson’s. The earliest known portrait of Jefferson, the painting was given to John Adams as a token of their friendship. 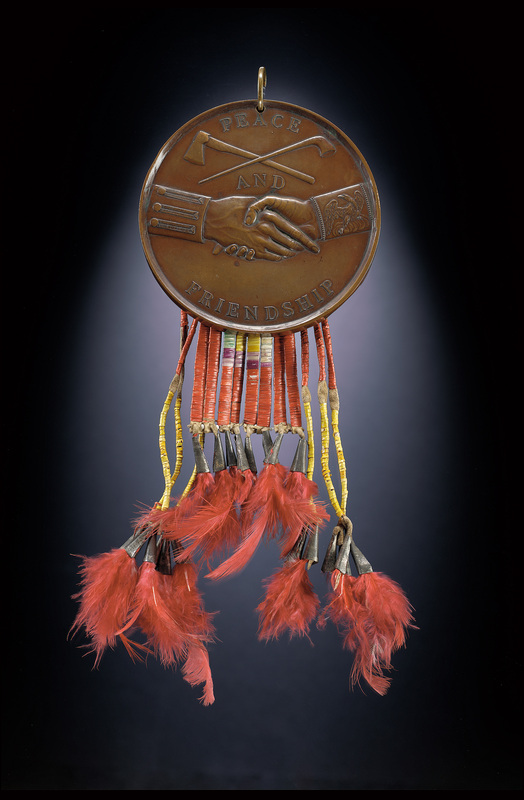 During Jefferson’s administration, a new style of peace medal was created that resembled those used by the British and was an integral part of the U.S. government’s relations with Native Americans in the 18th and 19th centuries. The medal includes a bust of Jefferson on one side and clasped hands and the motto “Peace and Friendship” on the other. A replica of Jefferson’s 1805 life portrait, Stuart painted the oil on canvas after multiple requests from the President. The stamp with Jefferson’s image was introduced in September 1954 and was valued at 2 cents. 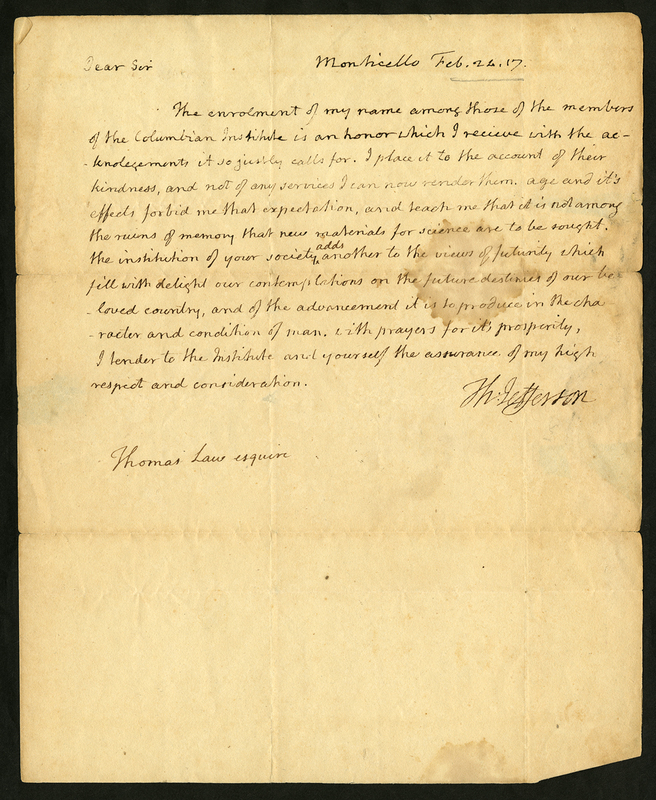 Jefferson expresses his gratitude for being appointed an honorary member of the Columbian Institute, a literary and scientific society in Washington. The National Portrait Gallery has over 40 prints, drawings and other objects that depict Thomas Jefferson. Thomas Jefferson’s private text, The Life and Morals of Jesus of Nazareth—colloquially known as the Jefferson Bible—is made up of excerpts from the Four Gospels of the New Testament in Greek, Latin, French and English. Thomas Jefferson peace medal (dated 1801) with quilled attachments, formerly owned by Arapaho chief Powder Face (ca. 1830-ca. 1886). 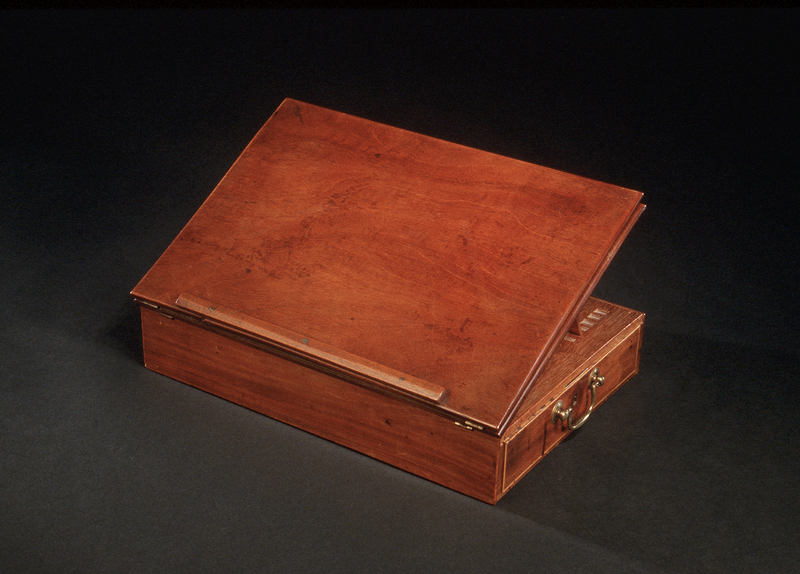 In 1776 Thomas Jefferson wrote the Declaration of Independence on this portable lap desk of his own design.